A few images of the facelifted 2017 Toyota Corolla have been officially released. The Corolla sports the company’s current design language and a number of new safety tech. The sedan seen here set to be launched in Australia in the first quarter of 2017. Design-wise, the Corolla possesses the brand’s “Keen Look” and “Under Priority” design language. Noticeable elements include a new bumper and a new sleeker grille that’s flanked by redesigned headlamps. In the rear, the Corolla sports a new pair of LED tail lights. The top-of-the-line ZR variant for Australia will be equipped with a set of new LED headlamps with LED daytime running lights. It will also come with door handles finished in a chrome trim and a thinner chrome garnish that goes across the rear. The other significant update is in the safety department. Safety tech standard on top Aussie cars will include a pre-collision system (PCS), lane departure alert (LDA) and automatic high beam (AHB). The systems will rely on laser and a camera that’s housed at the top of the windscreen. The active safety tech will be optional on lower Ascent and SX variants Down Under. No details have been released about the Corolla facelift’s engine and gearbox. 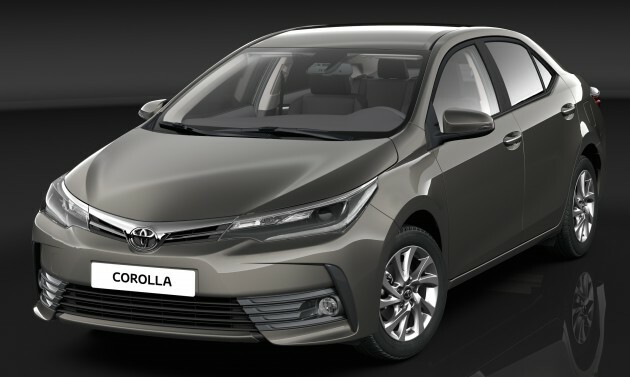 In Malaysia, the Corolla Altis is offered with a 2ZR-FE 1.8 litre engine with 139 PS and 173 Nm of torque, and a 3ZR-FE 2.0 litre unit with 145 PS and 187 Nm. Both are paired to a CVT transmission with seven virtual ratios. Like what you see? Click to enlarge and compare the new look with the current car pictured below. stability control got come in as standard or not?